We are a friendly local club catering for runners of all ages and abilities who meet twice a week at 7:00 pm at Thornbury Leisure Centre. Come along and try it out before you need to join. Our main club session is every Thursday when we go for a steady run in various groups based on ability. Just introduce yourself at our welcome desk outside the Filnore Suite. Every Tuesday we meet in the top car park for a choice of sessions including steady run groups and coached interval training. We will also have more beginners’ courses starting in 2019 . On Sunday mornings a group often meets for longer runs (meeting point varies). You can see our latest activities or keep in touch on Facebook or on the News Page. Annual membership renewal is now OVERDUE – click here. 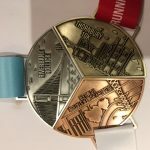 We organise three races each year, all of which filled up in 2017 and 2018, and now include the much sought after interlocking set of medals which you can collect from each race so make sure that you register early. Thornbury 10 K Road Race is on Thursday 11th July 2019 at 7pm. Click to see the 2018 results and more…. Oldbury Power 10 Miler Road Race will be held on Sunday 1st September 2019. It is a flat fast road course. You can see results for last year here. The Riverbank Rollick multi-terrain was run on Sunday 13th January 2019. Click to see the photos and results. For Club weekly posts and results see “News” under “About” (click here).